Milwaukee Bucks' Thon Maker is fouled by New Orleans Pelicans' Tim Frazier. 'The Greek Freak', Giannis Antetokounmpo is taking the NBA by storm. The 24-year-old unicorn is the league's front-runner for MVP on a Milwaukee Bucks team battling for Eastern Conference supremacy. 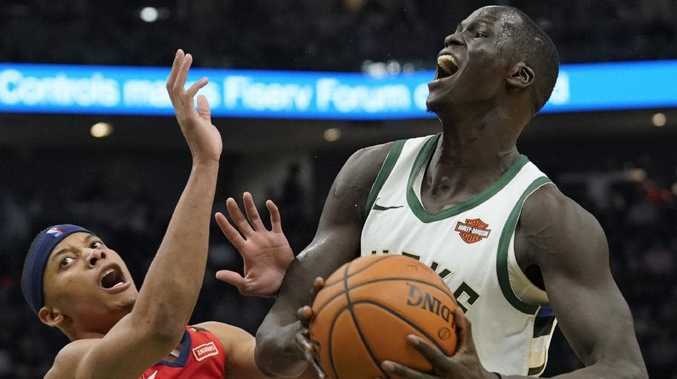 Approaching the peak of his powers, the two-time All-Star caught up with the Herald Sun after a recent practice to discuss the deep connection he's formed with Sudanese-Australian, Boomers star, Thon Maker. "Thon is my African brother, man," Antetokounmpo exclaims, proudly pointing up to the Sudanese and Nigerian flags that hang above the practice courts alongside the Australian flag, signifying Maker's adopted homeland. Antetokounmpo and Maker are attached at the hip on game days, with their lockers positioned side-by-side, they can often be seen deep in passionate conversation on game-day. "I treat him like my little brother, I always talk to him and he's even talks to me now. Before the game he tells me not to settle, to be aggressive, to do my thing out there." On the court, Antetokounmpo reveals the secret words that help pull the two-time All-Star back in line if he begins to fray from his usual efficient dominance. "We have a thing whenever he or I get mad we tell each other 'attitude check', we will then look at each other and say 'praise the Lord', we know we are blessed, we are fine and we are going to keep on getting better. "Whenever that happens, we know it's time to get out of our moodiness and move forward." Some may be surprised to hear that the developing Maker would challenge a player of Antetokounmpo's status, but he brushes those thoughts aside, with his typical infectious enthusiasm. "We've spent so much time playing together that he knows what I'm capable of and I know what he's capable of, so whenever I see him either slacking or going through the motions, I will remind him and help motivate him and get him going," Maker explains. "It's just our friendship but also being competitors. I'm not always out there to show what I'm capable of, so why be selfish when I can still help us win." 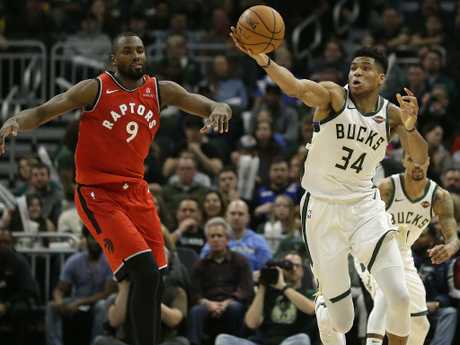 Milwaukee Bucks' Giannis Antetokounmpo steals the ball from Toronto Raptors' Serge Ibaka during the second half of an NBA basketball game at the weekend. The mutual respect was born from 21 days of brutal off-season workouts in July 2017. "Giannis told me to come back from Summer League and told me I'll definitely get better through working out with him so I told him I was on my way," Maker recalls. "We were working out literally three times a day, two on the court, one in the weight room, it was just non-stop. 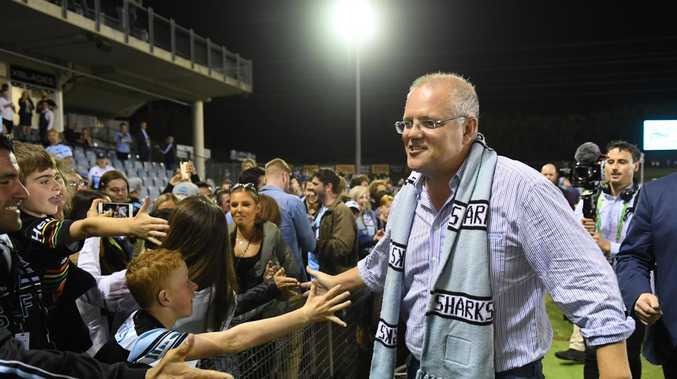 After that we would play one-on-one and we would go at it for hours for three weeks straight until finally the medical staff put a stop to it." Similarly, Antetokounmpo recalls the brutal nature of those sessions, in fact, he still carries the physical proof. "I've still got scratches from two years ago from those workouts, we were just going at it like lions fighting out here, it was great," he says with a smile while showing me scars on both forearms. Antetokounmpo believes the sky is the limit for Maker and the Bucks, he just has one piece of advice for his great friend. "Just keep getting better, that's all he can do, that's all he can control," he said. "The good thing with Thon is that he always stays positive, no matter what's going on, he stays positive. "I want he and I to build something special in Milwaukee because I know he's going to be here for a long time."